The recently approved 56 floor, 658ft, Regal Tower will dominate Birmingham’s skyline and become the tallest glass building in the UK outside of London. Located in the Broad Street area, the building will be covered entirely by a glass wall that will act as a skin to insulate and control core temperatures. The centre piece of the building will be a glass crown at the summit created by several glass ringlets that will create the look of a medieval lantern tower; the best standing equivalent of which is St Botolphs Church in Boston in Lincolnshire. 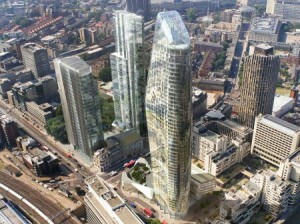 Completion of the tower is pencilled in for late 2013; however this may be extended depending on the planning process. Property development and investment company Beetham, who own two of the UKs tallest glass buildings; Hilton Manchester and West One in Liverpool, are now developing a tower in London that will be called 1 Black Friars and will be completed to coincide with the opening of the Olympic games in 2012. Although tall – it will stand at a dizzying 568ft height isn’t what makes this project stand out as its shape is what makes this glass building really unique. Shaped like a giant glass sail 1 Black Friars will have a peculiar impact on London’s skyline in the same way the Gherkin had. People will refer to this building’s appearance before its height and marvel at the giant curved glass edges as it emerges out of the earth like a giant shark fin. The scale and size of these modern glass sky scrapers will inevitably create challenges when it comes to maintenance; and as we pointed out in an earlier post about the Burj Khalifa in Duabi, this can require some serious man power, especially in dry climates. However, glass technology like self cleaning glass, as Pilkington glass has developed with the Pilkington Activ™ range, is proven to reduce the man hours and money spent in keeping a buildings glass exterior clean and aesthetically pleasing.